Wall Street has lots of stock indexes. Everyone knows the NASDAQ and Dow Jones Industrials, but there are hundreds of other indexes for almost every sector and capitalization. With that in mind, I offer the Google Dependency Index, which is composed of a list of public companies that essentially find themselves completely at the mercy of Google. I put this list together mostly as an exercise to quantify just how important Google was to the direct financial performance of other public Internet companies and I have to say that after going through the exercise it has convinced me that Google A) is actually even more powerful than people perceive it to be B) there will inevitably be a backlash against this power. America Online (AOL): Ever wonder how much Google pays AOL to be its default search engine? Well in 2009, Google paid AOL $556M or 17% of its total revenues for the privilege. Given that this referral revenue comes with very little costs, it’s a safe bet to assume that the share of AOL profits attributable to Google are probably are least 30% and perhaps higher. Answers.com (ANSW): Question: How much money you could make if you started a wildly popular web site and only monetized it only using Google Adsense? Answer: you would make about $21M in gross revenues, or at least that’s what Answers.com did in 2009. Answers, according to Quantcast, is the 15th most visited site in United States with 55M monthly unique visitors, most than craigslist or Bing or MySpace. In 2009, Google generated 89% of Answers.com’s traffic and 88% of its revenues. Infospace (INSP): Infospace has a collection of “meta-search” web sites, the most prominent of which is Dogpile.com. These meta-search sites split any ad revenues from click-throughs with the search sites. 95% of Infospace’s $207M in 2009 revenues came from either Google or Yahoo in return for search traffic and while Infospace doesn’t disclose the split between the two, it’s a safe bet that with Google’s ever increasing market share, Google accounts for an ever increasing share of that 95%. Incredimail (MAIL): Incredimail is a software developer that used to make it’s money by selling share-ware applications such as a POP3 e-mail client and a universal chat client. It still makes those programs, only now it primarily monetizes those programs not through license fees, but by replacing people’s default search provider with Google and by integrating Google search into its programs. The results? Fully 70% of its $21.9M in revenues during the first 9 months of 2009 came from Google and that percentage is increasing quickly. Vertro (VTRO): Vertro has a similar model to Incredimail in that they develop a software program which generates revenues by directing search queries back to Google. In Vertro’s case they have a “universal toolbar” called ALOT. The search box on this toolbar points to Google. As a result, fully 90% of Vetro’s $19.6M of revenues in first nine months of 2009 came from Google. E-Health (EHTH): Quick question: Who has the #1 organic search position on Google for “health insurance” and the #1 paid search position? Why eHealth does. #1 Organic results for high value ecommerce transactions are worth a fortune and these days you can literally build a company on top of them. eHealth doesn’t disclose just how much of its new business is referred to it by Google, but it does note “We depend upon Internet search engines to attract a significant portion of the consumers who visit our web site” in its 10K. Internet Brands (INET): Internet brands runs a collection of web sites, many of them ecommerce lead gen sites, such as Cars.com. Internet Brands doesn’t publicly disclose how much of their traffic is referred by Google, but it’s enough that their lawyers forced them to include a risk factor which says that search providers drive a “significant amount” of their traffic. Local.com (LOCM): During the first nine months of 2009, Local.com spent $19M on paid search, $13M of that on Google, and that spending generated 56% of its overall traffic. Local.com’s traffic arbitrage expenses account for almost 45% of its total expenses. ShutterFly (SFLY): Shutterfly maintains high organic search rankings for its key products including photo printing and photo cards. These high organic results most likely drive a huge amount of its traffic. US Auto parts (PRTS): US Auto parts runs a large network of auto part supply web sites. One of the expressed goals of this “network” is to have multiple PRTS owned sites show up on the front page of organic search results and thereby increase the probability that PRTS will get a click-through one way or another. PRTS doesn’t disclose how important Google’s organic and paid search traffic is to its business, but it is the 2nd risk factor listed in their 10K. So there you have it, there are at least 10 public companies that basically owe their continued good fortune to Google one way or another and thus clearly belong in the Google Dependency Index. This dependency not only underscores just how important Google is to the overall Internet economy, but it sets the stage for the inevitable backlash against Google because some of these companies will inevitably cry foul should they lose a significant portion of their much prized Google traffic. Google’s response to such cries will likely be, “You can’t blame us for the changes, our unbiased algorithm did it”, but as I will outline in my next post, Google’s algorithm is rapidly and inevitably becoming anything but unbiased and this transformation will ultimately make Google more evil than good in most companies’ minds. If you have a suggestion for other public Internet companies that should be included in the index, leave a comment with the ticker and an explanation as I'd be interested to see what nominations other people have. This is not investment advice, just some observations about how damn powerful Google has really become. Please read my disclaimer at the bottom of this page. Internet stocks outperformed the market in 2008, albeit in the wrong direction. Overall, the internet sector declined -52.2% during 2008 vs. the NASDAQ's -40.5% decline and the S&P 500's -38.5% decline. Out of 128 year-end stocks in the sector, the average stock declined by -52.3% and the median stock declined by -56.2% indicating that declines were pretty well balanced across small and large cap Internet stocks. It's interesting to note that Google, which accounts for a whopping 41% of the sector's capitalization was down 56%, slightly more than average, which means that Google actually underperformed the Internet sector as a whole. About the only notable trend in the Top 10 was the strength of Chinese Internet stocks which is kind of surprising given that the main Chinese market was down 65% for the year. Some of this may have to do with the fact that Chinese Internet firms already traded at very low relatively PE's prior to the crash but in general it's a bit confusing. In terms of losers, as with our review of Software stocks, the competition to make the list of Top 10 losers was fierce and required an even bigger decline to make the list. No real trends here either except to point out the that top two companies changed their names during the year as part of a rebranding/restructuring exercise. Kowabunga indeed! 2007's list of top performing Internet stocks provides a little bit of de ja vu from 2006's list. As was the case in 2006, China remained a hot investment sector, although this year's China winners are different than last year's. Three of last' year's Top 10 performers repeat in 2007, something to be truly admired in the rough and tumble Internet sector. To qualify for this list the company had to start 2007 with a market cap of at least $50M and its business had to be focused on the Internet. Comment: The Chinese stock market was "en fuego" all year and what better way to play that market than an Internet company that sells online financial services products and information. Comment: China's #1 search engine appeared to be pulling away from the pack in 2007 despite desperate attempts by Yahoo and Google to get in the game. Right now the market seems to think Baidu is going to win. Comment: Formerly known as QXL and a serious competitor to EBAY in Eastern Europe, QXL's stock was supported by takeover rumors all year, which turned out to be true in December when South African media group Naspers announced a deal to acquire it. Comment: Aquantive was acquired by Microsoft in the middle of the year after they scrambled to respond to Google's acquisition of privately held Doubleclick. Comment: Last year's #10 performer, Priceline is back again, a very impressive performance for what was thought to be a mature company. Priceline continued to school the rest of the online travel field, especially with its expansion into Europe. Comment: Last year's #7 stock moves up one spot to #6. After a successful IPO in 06, Ominture grew quickly in 07 and announced the acquisition of its main public competitor (VSCN). Comment: The granddaddy of online retailing flexed its growing muscles in 07. Thanks to growing revenues and somewhat decreased tech spending margins expanded quickly and earnings accelerated. Comment: One of China's largest portals saw impressive growth and benefited for investor appetite for all things China. Comment: Last year's #2 stock, holds on to a Top 10 position. Unlike other gambling stocks, Gigamedia's focus on Asia as well as its casual games help it buck the trend and keep growing without regulatory interference. Comment: The Internet's largest jewelry retailer saw its stock take off in 2007 and it reached critical mass and began to drive impressive margins. In 2004 there were, by my count, about 18 acquisitions of public software companies and Private Equity firms made none of them. By 2006 however, not only had the number of acquisitions risen to 32, but Private Equity firms accounted for 25% of them, up strongly from 11% of deals in 2005 (See table below). At this rate I wouldn't be surprised to see private equity account for over 50% of deals in a couple years. Who Said Maintenance Revenues Aren't Beautiful? Private equity firms have taken a liking to software firms not because they believe software to be a great growth market but largely because most software firms have what PE firms might call "immature" balance sheets, with little or no debt and relatively high levels of cash. Rather than targeting fast growing software firms, PE shops typically target "mature" software companies as they not only tend to have lots of cash but they also derive a large percent of their revenues from maintenance revenues. These revenues are seen by private equity investors and, more importantly their lenders, as a stable source of cash flow that can be used to finance lots of debt. Do dividend recap in which you simultaneously lever up the balance sheet and dividend out all the cash you just borrowed plus most of the existing cash on the balance sheet. Raise new fund off of massive IRR created by dividend recap. Raise prices, slash R&D, increase sales and marketing. Take company public/sell it at same PE you bought it for to investor/large company apparently unfamiliar with the concept of enterprise value. Now I admit this is a bit of snarky characterization of PE software deals because software offers some unique scale effects in SG&A, but I think this characterization is probably closer to the truth than a lot of mumbo jumbo about "value add" "synergies", etc. For my money,the most notable (and most ironic) private equity buyout of public company in 2006 was the acquisition of SSA Global by Infor. Why? Because SSA Global was itself a private equity sponsored roll-up of public software companies (including Baan, Ironside, and Epiphany) which was public for all of a year before it was bought by another private equity sponsored roll-up of public companies, Infor, which now rather immodestly claims to be "the fastest growing enterprise software company in the world". To have the two companies that are following the private equity playbook to a T merge with one another after the first one was only public for a year is just priceless. I can't wait to see the prospectus for Infor and how they back up their claim to be the fastest growing enterprise software company in the world, it should be a classic. Software stocks may have only performed in-line with the rest of the market, but these stocks were at the top of the class. The easiest way to make this list in 2006 was to be bought by a strategic acquirer such as IBM, HP, pr EMC. 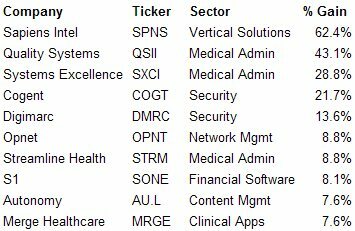 Other than that, it's pretty much a grab bag of stocks but medical software stocks were particularly strong, as were open source and VOIP related stocks. Comment: Pioneer in enterprise IP Telephony saw rapidly increasing sales as enterprises started to take VOIP seriously, especially call centers. Comment: Operator of open source software portal "sourceforge.org" and geek news site Slashdot.org saw shares rise as Sourceforge.net grew quickly and as it released an enterprise software version of sourceforge.org. I will be moving this to the Internet sector for 2007 given that it is more much a content/e-commerce play now than it is a software company. Comment: Early leader in hard tokens and public key encryption was bought by EMC this past summer for a nice premium. May be first of several security acquisitions by EMC. Comment: Provider of a multitude of wireless software products and owner of the venerable Stuffit program, saw sales rise as carriers such as Verizon stuck deals for several of their software products. Comment: Strong demand their medical records management software thanks in part to government mandates helped propel this stock upward. Comment: Another medical records software company. I think I see a trend. Comment: Business intelligence vendor benefited from finally turning profitable and from it's emerging open source platform. Comment: Application performance management vendor that put enough of its accounting problems behind it to secure a sale to HP. Comment: One of 3 public software companies that IBM bought in 2006. Not sure how this fits into IBM's "we don't compete with our application partners" party line. Comment: EDA tools vendor saw a nice rebound after a terrible 2005 as license sales picked back up. While 2005's Internet winners were dominated by the themes of online advertising and gambling, 2006's key themes were China and broadband. Four of the Top 10 stocks were focused on China while 3 were focused on broadband infrastructure. Comment: If you need proof that hosting is hot again, look no further than Navisite. This once left for dead application hosting company had a huge year including a suspiciously strong December. Comment: What do you get when you combine China with gambling? An incredibly hot stock that's what. Comment: The right ticker at the right time. With anything China related hotter than a Szechuan Spicy Beef, it was China.com's time to shine. It didn't hurt that they made a major move in online gaming too. Comment: Internet video was white hot in 2006 and Akami's CDN serves the most video of anyone so investors saw them as platform level pure play on the growth of internet video. Comment: After a successful merger with long time competitor The Wedding Channel, the Knot.com proved that near monopoly positions in attractive internet content niches can be quite rewarding. Comment: China's top online travel agency benefited from the overall China craze and increased travel by the emerging chinese middle class. Comment: The only IPO on the list. Omniture didn't go public until mid-year but made up for its late start as it became the SASS darling of online analytics and took market share quickly. Comment: China. World of Warcraft. Need I say more? Comment: Israeli ISP rises due to merger with rival and ventures in online video and broadband access. Comment: Rising hotel and airline fares combined with increasing business travel send consumers scrambling to find cheap deals the Internet.